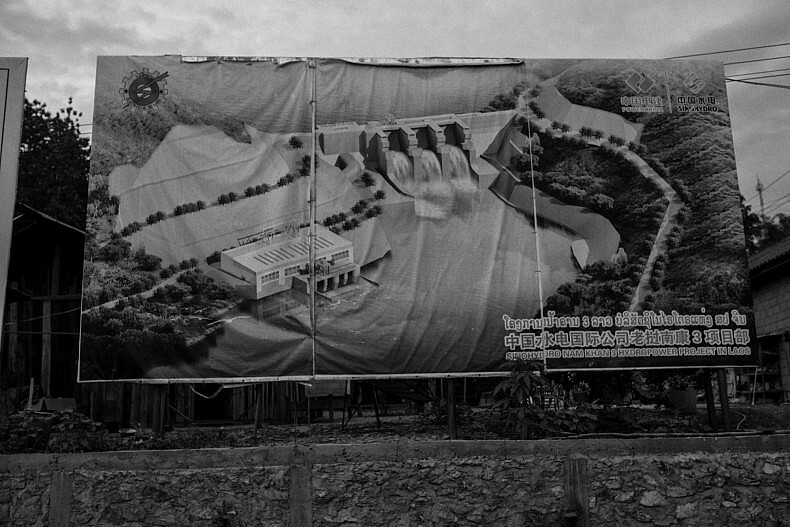 After seeing Laos’ first ever hydropower dam on the Nam Ngum river, we wanted to investigate the consequences of a more contemporary dam. Over several days we visited the construction sites and spoke to those who had already been displaced by the projects to learn more about the human costs of power. 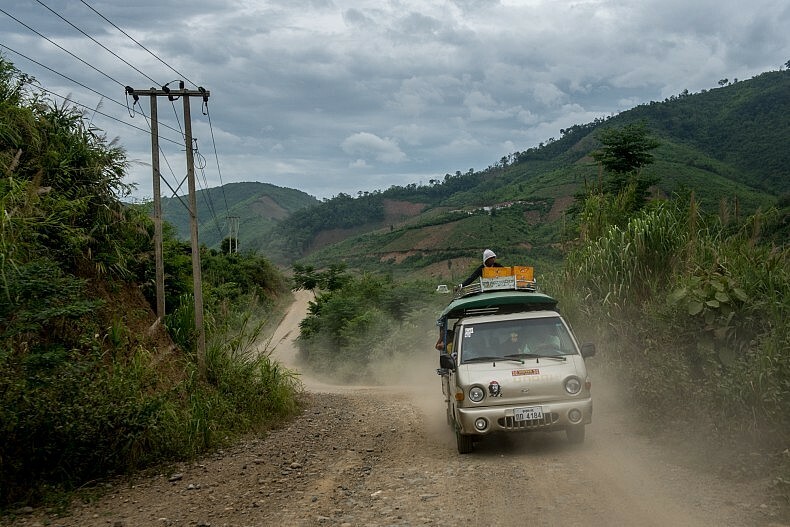 A passenger vehicle drives along the access road that links the Nam Kong 1 and Nam Kong 2 dam construction sites. Photo by Luc Forsyth. We had been driving for an hour on the dusty mountain road when we hit the military checkpoint. As the lone passengers in the back of the songthaew (a flatbed truck fitted with benches) we figured it would be impossible to avoid scrutiny and were certain that we would be turned back at any moment. 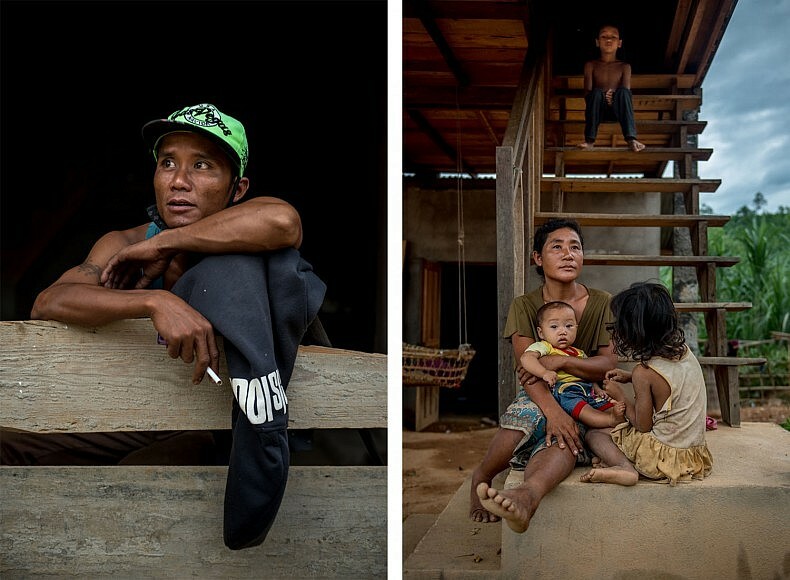 With the media’s widespread — and overwhelmingly negative — coverage of Laos’ Thai-financed Xayaburi dam, we thought that we, as camera-toting foreigners, would be less than welcome at the dam construction sites along the Nam Khan river. We had come to the Nam Khan to further investigate the human impacts of Laos’ hydropower dams after visiting the nation’s first ever damming project on the Nam Ngum river. The people we’d spoken to there had mixed opinions about the dam’s enormous reservoir (known locally as the Laos Sea) that had flooded much of the area when it was finished in the 1980s. But it had been more than 30 years since the project had been completed and people had had decades to adjust to the change. 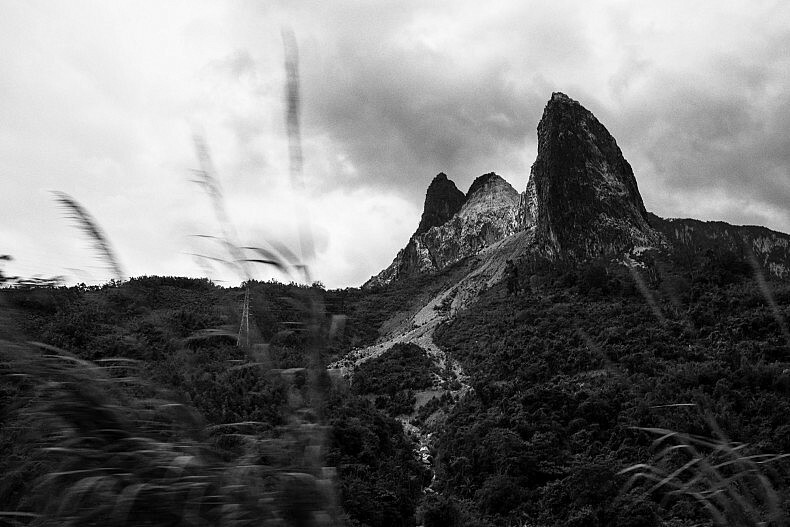 We wanted to speak to people who were on the front lines of the nation’s current damming rush. 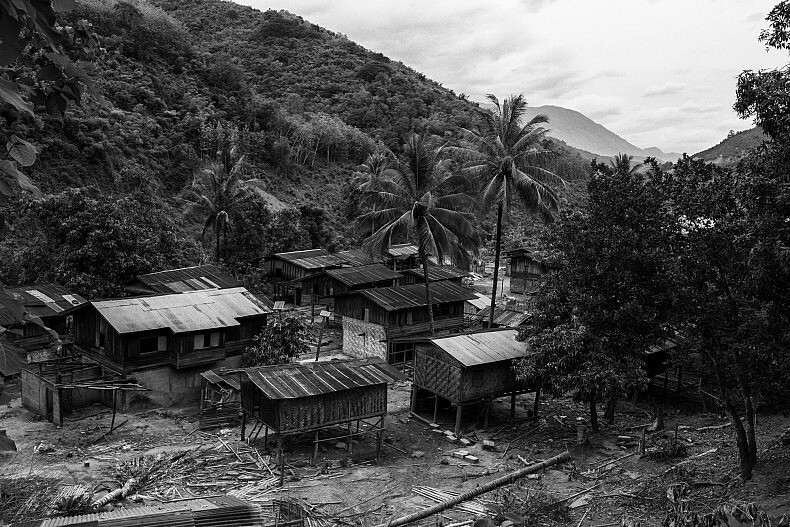 A family sits in front of their allotted home in the Samaky Sai relocation camp. Photo by Luc Forsyth. 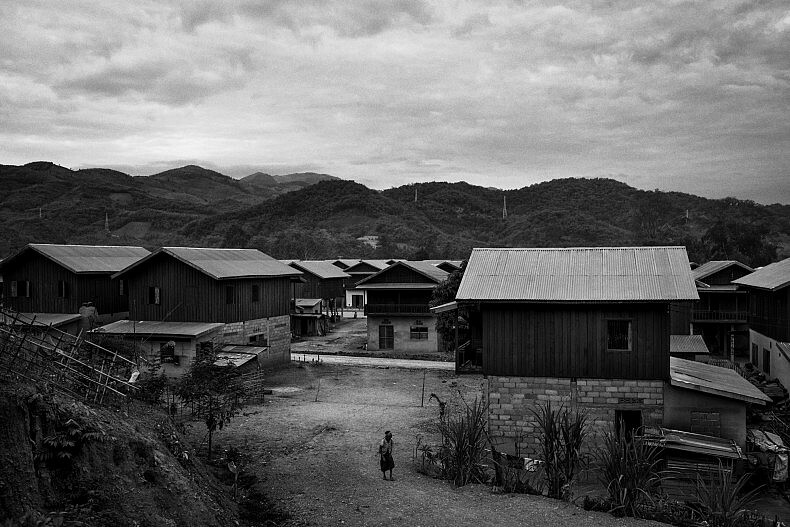 The camp is home to hundreds of families displaced by the construction of hydropower dams. Photo by Gareth Bright. 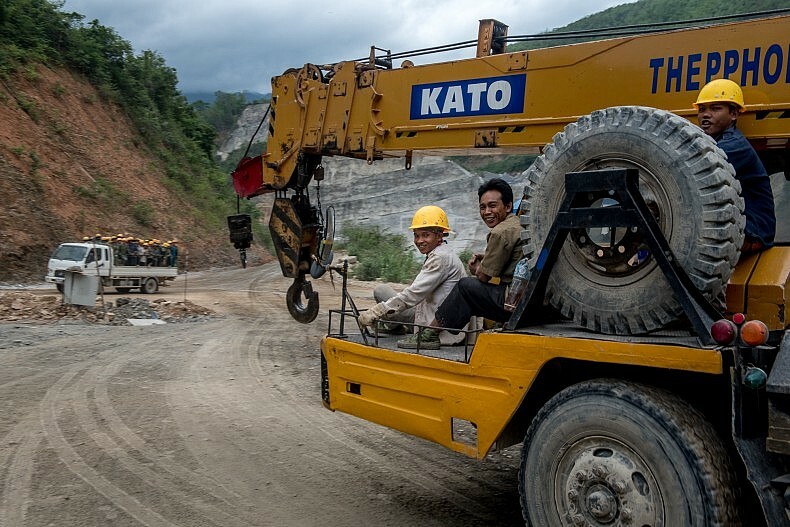 Most of the residents used to be farmers or fishermen in remote mountain villages, but since arriving in Samaky Sai have found few employment opportunities other than Sinohydro – the company responsible for their displacement. Photo by Luc Forsyth. A billboard about the dam shows what it will look like upon completion. Photo by Gareth Bright. Pich, like many of the other occupants of Samaky Sai, had come from a small and remote mountain village further up the Nam Khan where her family had farmed rice. While life in the village was far from easy, Pich told us, and lacked access to modern amenities like electricity and plumbing, essential items such as food and firewood had been abundant and cheap. A barter economy allowed her to trade rice for whatever her family couldn’t grow on their own, and a walk into the jungle would usually provide fresh coconuts or bananas. Cash was used rarely, and typically only for specialty items that had to be brought in from the city. 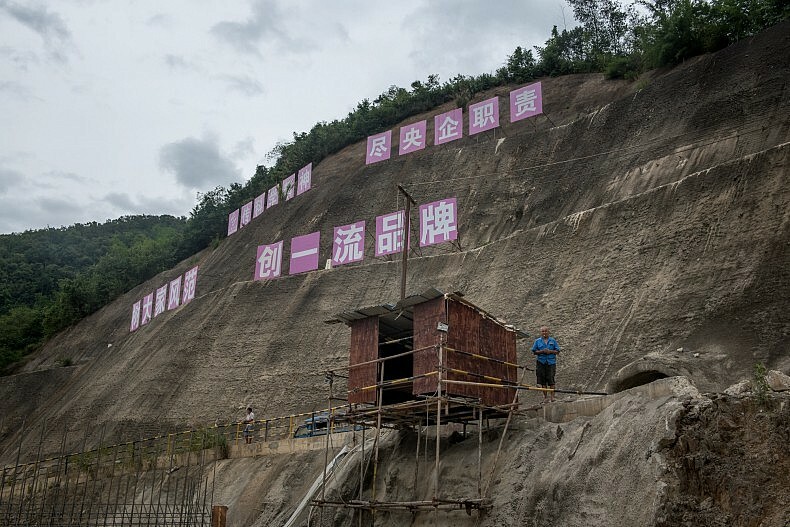 Muoi makes 60 000 kip ($8) per day working as construction worker for Sinohydro. 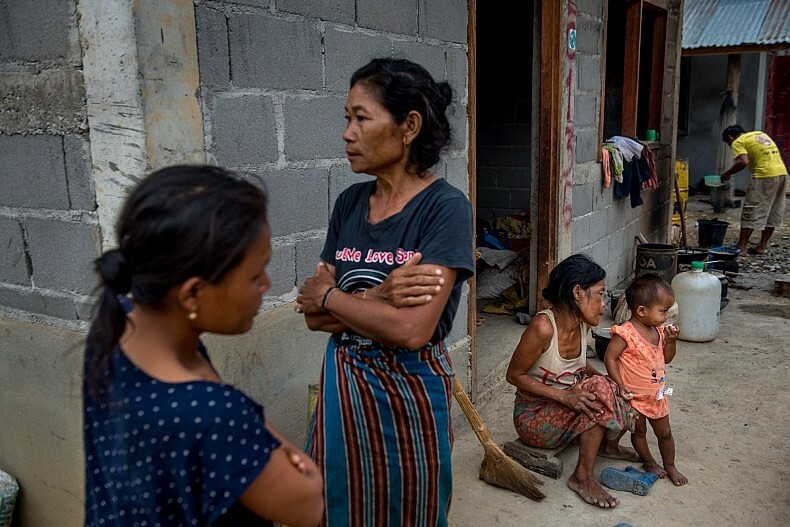 And Pich, 28, is a mother of five who lives in the Samaky Sai relocation camp. Photos by Luc Forsyth. Finding the money to buy food has become a constant problem since being forced to leave the village for the camp. Photo by Gareth Bright. 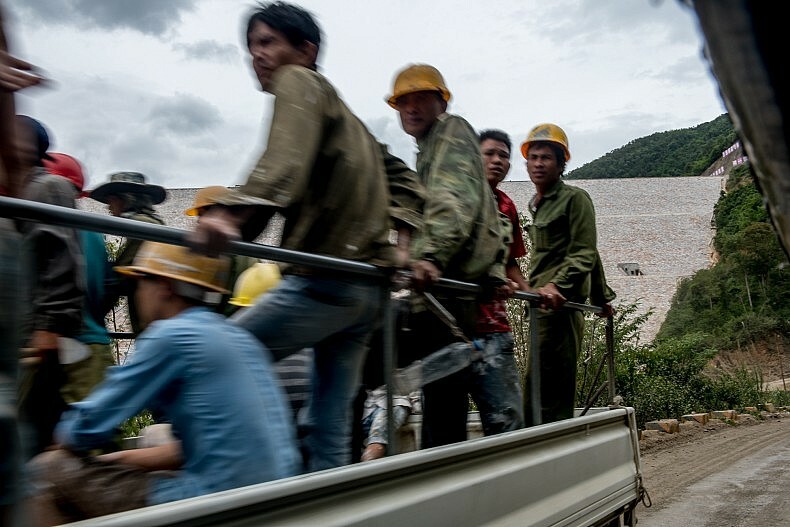 Chinese construction workers drive through the site of the Nam Kong 2 dam. Photo by Luc Forsyth. Many of the men living in relocation camps work building the dams that will inundate their villages. Photo by Gareth Bright. 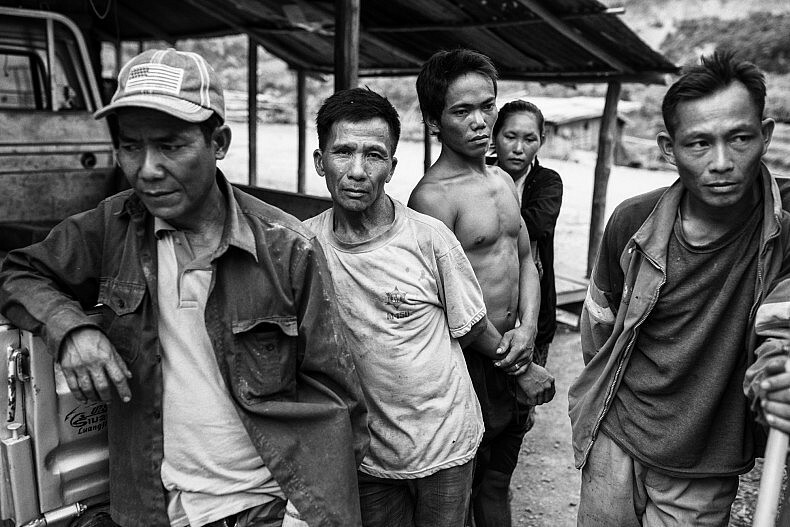 Construction workers on the site of the Nam Kong 2 dam. Photo by Luc Forsyth. 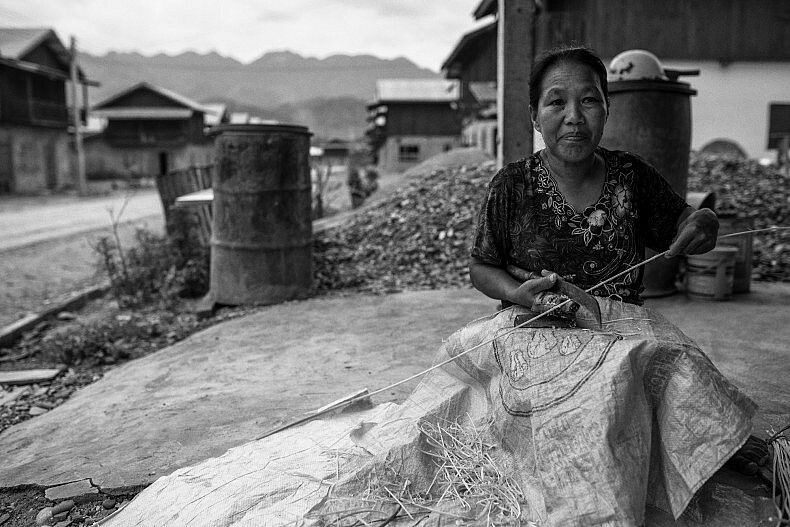 Chan Souk, 62, makes traditional Laos brooms in front of her home in the Samaky Sai relocation camp. She says finding the money to buy food has become a constant problem since being forced to leave her village for the camp. Photo by Gareth Bright. 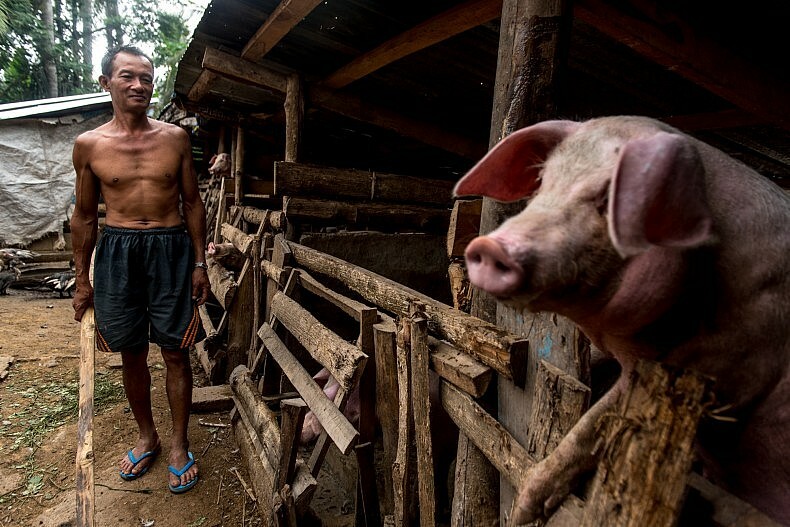 A pig farmer tends to his livestock in the village of Don Mo. While just a few hundred meters away from the Samaky Sai (United Village) relocation camp, Don Mo has abundant farmland and the quality of life is vastly superior to that in the camp. Photo by Luc Forsyth. 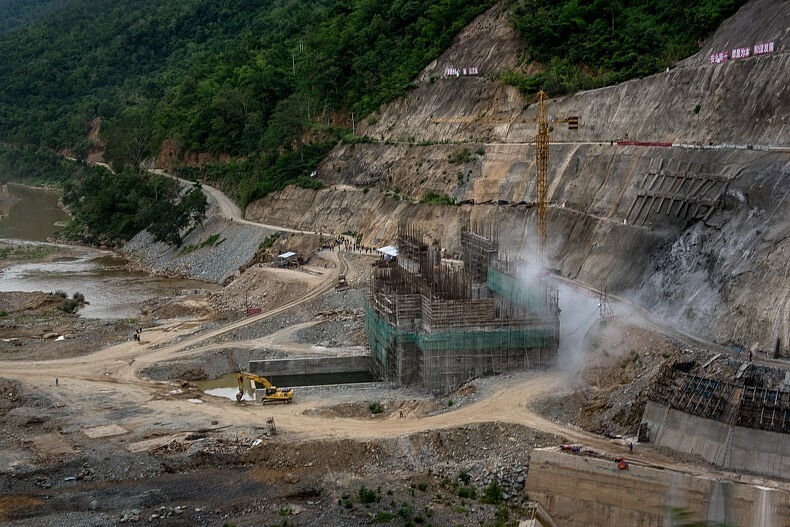 The 3 proposed dams on the Nam Kong river are a massive undertaking. Photo by Gareth Bright. The 3 dams are an impressive engineering feat. Photo by Luc Forsyth. 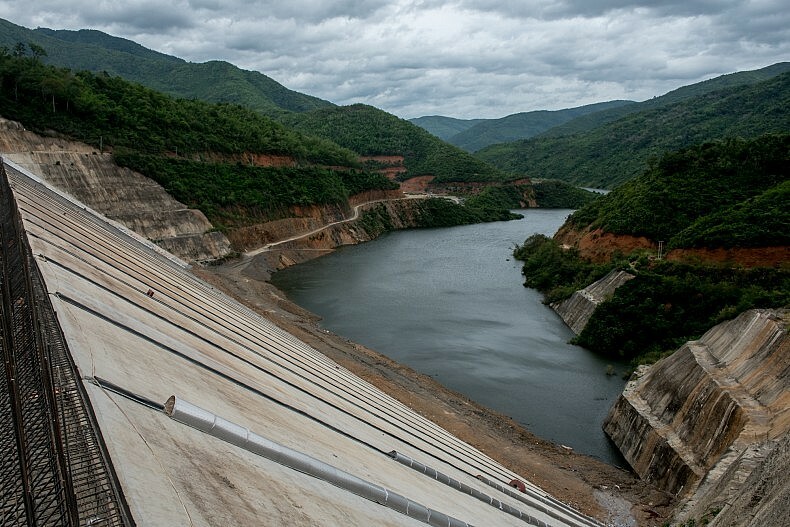 A Chinese security guard watches over the top of the Nam Kong 2 dam, which is still under construction. Photo by Luc Forsyth. Perched on a small mountain side shelf, Khone Wai was situated between dams 2 and 3 on the Nam Khan — placing it squarely in the path of the future reservoir. The majority of houses were empty and looked long-since abandoned, apart from a few that still had laundry hanging from the front porches. At first we seemed alone apart from a few small herds of goats, but eventually a middle-aged man appeared to greet us. 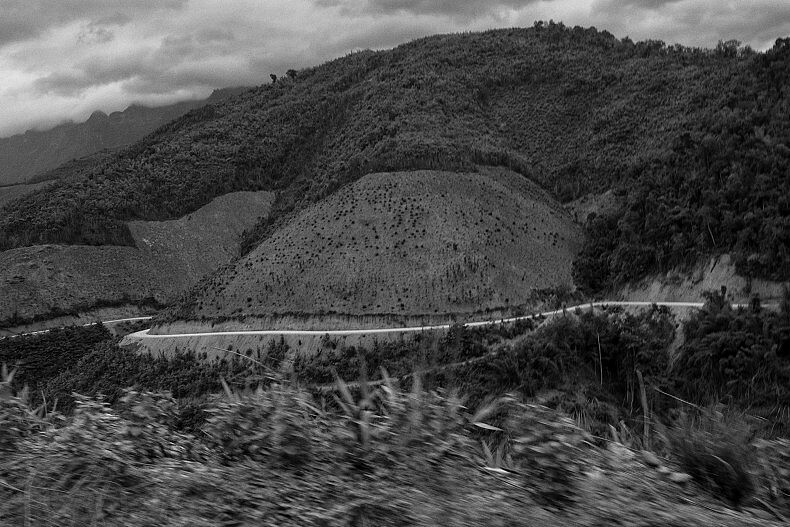 Once completed, the dams will hold back a large reservoir, fundamentally changing the landscape of this part of Laos . Photo by Gareth Bright. “Everyone is gone,” he told us, “they have all been moved for when the dam is finished [in a few months]. Only the animals are left, and we come to look after them.” Fifty years old and weathered from decades of farming, he politely declined to tell us his name but explained that he would soon be selling the goats and moving permanently to Samaky Sai. 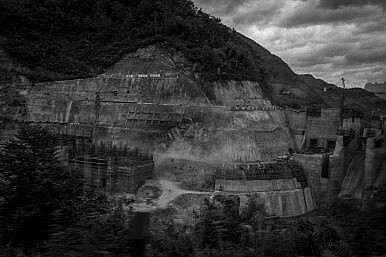 Once completed, the 3 proposed dams on the Nam Kong river will inundate around 1500 sq km of land, displacing thousands. Photo by Luc Forsyth.